Can CD44 serve as a potential therapeutic target in rheumatoid arthritis? CD44 is a multistructural cell-surface glycoprotein that can theoretically generate close to 800 isoforms by differential alternative splicing. At present, several dozen isoforms are known. The polymorphic nature of CD44 might explain its multifunctionality and its ability to interact with many cell-surface and extracellular ligands, the principal one being hyaluronic acid (HA). Of the many CD44 functions, our review focuses on its involvement in cell–cell and cell–matrix interactions, as well as on its implication in the support of cell migration and the presentation of growth factors to their cognate receptors. Cells involved in pathological activities such as cancer cells and destructive inflammatory cells, and also normal cells engaged in physiological functions, use cell-surface CD44 for their localization and expansion at extravascular sites. This article reviews the evidence that the joint synovium of patients with rheumatoid arthritis (RA) contains considerable amounts of various CD44 isoforms as well as the HA ligand. The review also shows that anti-CD44 monoclonal antibody (mAb) directed against constant epitopes, shared by all CD44 isoforms, can markedly reduce the inflammatory activity of arthritis induced by collagen or proteoglycans in mice. Anti-CD44 mAb also interferes with the migration of RA synovial-like fibroblasts in vitro and is able to disturb the destructive interaction between RA synovial-like fibroblasts and the cartilaginous matrix. However, the transition from the experimental model to the patient's bedside is dependent on the ability to target the CD44 of cells engaged in RA pathology, while skipping the CD44 of normal cells. Inflammation, a local accumulation of fluid, plasma proteins and leukocytes (mostly neutrophils, macrophages and lymphocytes) initiated by physical injury, infection or an immune response, is normally a self-limiting episode. The inflammatory response is fostered by the upregulation of adhesion molecules on the surface of the inflammatory cells and endothelium, the activation of cell-surface and tissue enzymes, the delivery of chemoattractants, type I cytokines, growth factors and oxygen-derived free radicals, and by an intensive process of angiogenesis and continuous transendothelial migration of leukocytes from the blood vessels into the extravascular tissue. The ultimate outcome of an acute inflammatory response to infection is the eradication of the pathogenic microorganism, with minimal environmental damage. In contrast, the chronic version of this activity, promoted by persistent infection or an autoimmune reaction, is consistently being increased, like a rolling snowball, provoking irreversibly destructive consequences. To initiate and maintain their biological functions, both acute and chronic inflammations exploit virtually similar mechanisms, namely similar adhesion molecules, enzymes, type I cytokines, chemoattractants, growth factors and oxygen radicals. Constant targeting of elements associated with chronic inflammation can therefore cause damage to the defense mechanism against pathogenic microorganisms. Selective eradication of cells involved in pathological activities, such as cancer cells or cells mediating inflammatory tissue destruction, is a major challenge for modern medicine. Most, if not all, drugs and technologies (such as radiotherapy) used to destroy cancer cells or cells involved in damage related to inflammatory reactions (those occurring in autoimmune diseases including juvenile diabetes, multiple sclerosis, rheumatoid arthritis and ulcerative colitis) can also destroy normal cells that are essential to the survival of the individual. The development of drugs or technologies capable of targeting cells involved in pathological activities (cancer cells or inflammatory cells), while leaving the normal cells intact and functioning, would be a stunning victory for medical science. One way of coping with this challenge is to screen cancer or inflammatory cells for cell-surface structural entities expressed on cells engaged in pathological functions, but not on normal cells involved in physiological activities. Specific targeting agents (for example, antibodies or competitive peptides), recognizing the hypothetical structures or their countermolecules, should selectively neutralize the cells implicated in pathological functions, with minimal side effects. Although in the past three decades efforts have been made to identify such disease-specific cell-surface entities, the results are disappointing. However, the targeting of CD44 molecules and their ligands provides new opportunities in the search for specific therapies for cancer and inflammatory diseases. CD44 is a cell-surface glycoprotein involved in many vital normal bioactivities, including the interaction between cells and extracellular tissues, the support of cell migration in blood vessels and inside tissues, the presentation of growth factors, cytokines, chemokines and enzymes to other cells or to the surrounding tissues, and signal transmission from the cell surface to its interior, leading to apoptosis or cell survival and proliferation (reviewed in [1–4]). Cells involved in pathological activities (cancer cells or inflammatory cells) use CD44 to maintain at least some of the above-mentioned activities, but with destructive outcomes. For example, in a normal setting, cell-surface CD44 supports the migration of cells from the immune system toward sites of bacterial infection , resulting in killing of the invaders. Under pathological conditions, CD44 can support the migration of metastatic cells from the site of the primary tumor growth (for example, skin) to remote organs (for example, the lungs) or the migration of destructive inflammatory cells to potential sites of inflammation (for example, the pancreas in juvenile diabetes) [4, 6]. We and others have shown in animal models that monoclonal antibodies (mAbs) against CD44 can markedly reduce the pathological activities of malignant lymphoma [7, 8], diabetes , collagen-induced arthritis (CIA) [9–11], experimental colitis  and experimental allergic encephalomyelitis (analogous to human multiple sclerosis) , possibly by interfering with cell migration. However, such anti-CD44 mAbs can simultaneously target normal cells bearing CD44, damaging essential biological functions. Notably, the inflammatory cells involved in experimental colitis  need not necessarily be included in this category, because they are targeted by anti-CD44 mAb directed against a variant CD44 epitope that might not be expressed on most normal cells (see below). However, CD44 is not a single molecule but a highly complex genetic construction (Fig. 1). The structure (general scheme, Fig. 1A) is based mostly on mouse CD44; the functions (Fig. 1A, insets) refer mainly to human CD44, because the bulk of the data were obtained from human studies. The structure of human CD44 is similar to that of mouse CD44, aside from minor exceptions such as the fact that human CD44 is shorter by two amino acid residues, missing from the extreme amino terminus. Using disulfide bonds, the N terminus of the molecule forms a globular domain or, as shown in Fig. 1A, three globular subdomains. The conserved N-terminal region of the extracellular domain (about 165 residues), the transmembrane region (21 residues) and the cytoplasmic tail (72 residues) show at least 85% interspecies sequence homology. The nonconserved membrane-proximal region (about 85 residues) shows 35% interspecies homology and the variable region (about 410 residues) shows 65% interspecies homology. Structure, function and exon organization of CD44. (A) Structure and functions of CD44 glycoprotein [1–4]. CD44 structure. The heavy and intermediate black tracks represent the conserved N-terminal region of the extracellular domain, the transmembrane region and the cytoplasmic tail. The heavy black track at the N terminus represents the link module. The thin black track represents the nonconserved membrane-proximal region. 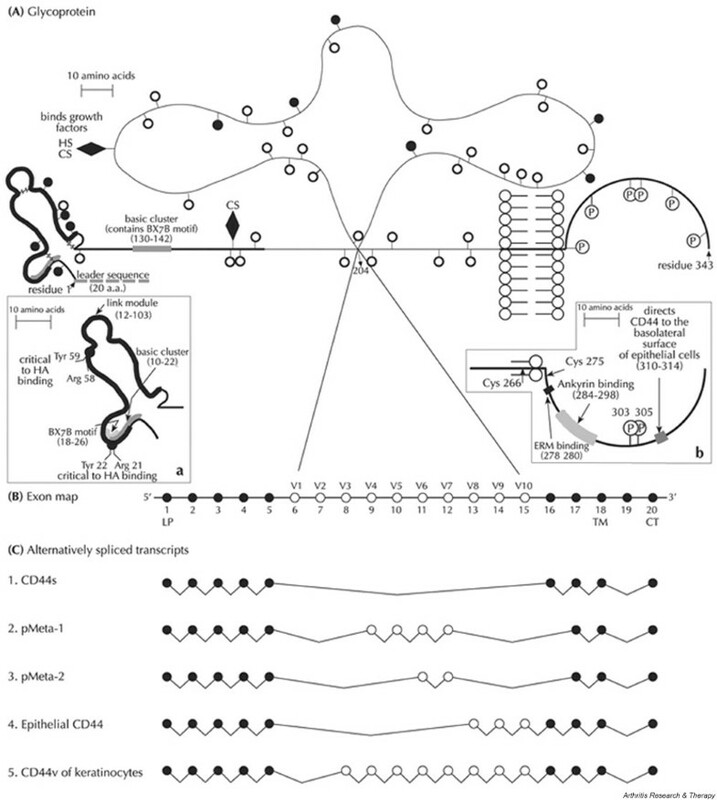 Filled circles, potential N-linked glycosylation sites; open circles, potential O-linked glycosylation sites; filled diamonds, sites for glycosaminoglycan (chondroitin sulfate [CS] or heparan sulfate [HS]) attachments (the HS of exon v3 is involved in the binding of growth factors); P, potential sites for phosphorylation. Insets: CD44 functions. Inset a, the basic cluster and the amino acids critical to HA binding. Inset b, binding sites for ezrin radixin moesin (ERM) and for ankyrin as well as two phosphorylation sites; the location of the sugars and the functional sites is for illustrative purposes only. (B) CD44 isoforms: exon map. Filled circles represent the constant-region exons; open circles represent exons that can be inserted by alternative splicing, resulting in the generation of the variable region. Note that exon v1 is not expressed in human CD44. LP, leader peptide-encoding exon; TM, transmembrane-encoding exon; CT, cytoplasmic tail-encoding exon. (C) Examples of alternatively spliced transcripts: 1, standard CD44, which lacks the entire variable region; 2, pMeta-1 (CD44v4–v7; exons v4, v5, v6 and v7 are inserted in tandem between exons 5 and 17 [residues 204 and 205]); 3, pMeta-2 (CD44v6,v7) (pMeta-1 and pMeta-2 are known as metastatic CD44 because their cDNA confers, upon transfection, metastatic potential on nonmetastatic rat tumor cells); 4, epithelial CD44 (CD44v8–v10); 5, keratinocyte CD44 (CD44v3–v10). This figure is reproduced from Wiley Encyclopedia of Molecular Medicine, CD44 entry by D Naor and S Nedvetzki, vol 5, pp 619–624 (2002), by permission of John Wiley and Sons, Inc. The various combinations of the variant exon products are inserted between residues 204 and 205; the maximal insertion of exons v1 to v10 is depicted in Fig. 1A (schematically shown as a clover-leaf shape). The total length of the extracellular domain is 250 residues (human is 248 residues) and that of the entire standard CD44 (CD44s) molecule (without the variable region) is 343 residues (human is 341 residues). The 20 residues of the leader sequence are not taken into account. The first amino acid of the mature protein is therefore residue 1. The N terminus of the molecule (the heavy black track in Fig. 1A) includes the link module (92 residues), which shows 35% homology to other HA-binding link proteins. The two basic clusters (gray segments in Fig. 1A, inset a) are involved in HA binding: the first (located inside the link module and overlapping the BX7B motif) binds this ligand more tightly than does the second one (located outside the link module and containing the BX7B motif; shown in the general scheme of Fig. 1A). The amino acids critical to HA binding are also shown in Fig. 1A, inset a. Cys-266 in the transmembrane domain (Fig. 1A, inset b) is important for HA binding in Jurkat cells. Cys-266 and Cys-275 can be used for palmitoylation. The cytoplasmic tail includes the binding sites for ezrin radixin moesin and for ankyrin as well as phosphorylation sites 303 and 305 (involved in cell motility). Segment His-310 to Lys-314 delivers a localization signal that directs the CD44 of epithelial cells to the basolateral surface (Fig. 1A, inset b). Theoretically, hundreds of CD44 isoforms can be generated by alternative splicing  of 10 (mouse) or 9 (human) variant exons, designated v1 to v10, inserted in different combinations between the two constant regions, consisting of five and four exons at each end of the molecule [1–4]. However, the number of CD44 variants (CD44v) identified so far is limited to a few dozen (Fig. 1), detected mostly on epithelial cells, keratinocytes, activated leukocytes and many types of tumor cell . Direct splicing of constant exon 5 to constant exon 16 (thereby skipping all the variant exons) (Fig. 1) generates CD44s, ubiquitously expressed on mesenchymal cells and on all types of hematopoietic cell [1–4]. Although alternative splicing is a most efficient means of enriching the genetic information stored in a single gene, post-translational modification by glycosylation and glycosaminoglycan (GAG) attachments further modifies the CD44 protein, allowing greater expansion of its variability and functions [1–4]. The multistructural nature of CD44 might also influence its ligand repertoire. Indeed, CD44 has a wide range of ligands, the principal one being hyaluronic acid (HA, hyaluronate, hyaluronan), a linear polymer of repeating disaccharide units (D-glucuronic acid- [1-β-3]-N-acetyl-D-glucosamine- [1-β-4]) n . The biological roles of hyaluronan include the maintenance of water and protein homeostasis, and the protection of cells from the potentially harmful effects of other cells, microorganisms and macromolecules . However, CD44 can interact with several additional molecules, such as collagen, fibronectin, fibrinogen, laminin, chondroitin sulfate, mucosal vascular addressin, serglycin/gp600, osteopontin and the MHC class II invariant chain, as well as with L selectin and E selectin (reviewed in  and ). In many cases CD44 does not bind to its ligand unless activated by external stimuli. As both CD44 and its ligand are ubiquitous, this mechanism should avoid unnecessary engagement of the receptor. In fact, three states of CD44 activation have been identified in cell lines and normal cell populations : active CD44, which constitutively binds HA; inducible CD44, which does not bind HA or binds it only weakly unless activated by inducing mAbs, cytokines, growth factors or phorbol ester ; and inactive CD44, which does not bind HA even in the presence of inducing agents. The involvement of CD44 in pathological activities might be confined not only to certain CD44 isoforms but also to their interaction with specific ligands. This interaction might be dependent on the type of CD44 isoform or its post-translational modification (glycosylation and GAG attachments). Furthermore, the type of CD44 isoform might dictate the pattern of the post-translational modification. The rich ligand repertoire of CD44 is possibly related to its multistructural nature. Discovery of novel CD44 ligands (as well as new isoforms) can be expected, as the list of this receptor's countermolecules is continuously growing [2, 4]. Nevertheless, the identification of existing as well as novel CD44 ligands, especially those associated with pathological activities, might provide new targets for therapy. If the CD44 countermolecule is preferentially engaged with cell-surface CD44 involved in a pathological activity, targeting of the ligand could also be a relatively selective therapeutic modality. Circulating naïve lymphocytes entering the lymph node through the high endothelial venule, and leukocytes entering inflamed tissues through venule capillaries, use a similar mechanism of transendothelial migration, as shown by the three-step Springer model . In the first stage, L selectins and sialomucin-like glycoproteins, expressed on the cell surface of leukocytes flowing in the blood vessels, form loose interactions ('tethering') with their countermolecules (sialomucin-like molecules and E or P selectins, respectively) expressed on the endothelial cells, and then initiate rolling attachments mediated by an adhesion–de-adhesion process. However, it has been reported that in at least several cases, leukocytes entering infected tissues through inflamed capillaries , and lymphoma cells infiltrating peripheral lymph nodes , exploit cell-surface CD44 glycoprotein rather than selectin for tethering and rolling on endothelial cells, using their cell-surface HA as a countermolecule. In the second step, chemoattractants produced by the endothelial cells or cells located in the extravascular tissue interact with the G-protein-like receptors of the rolling cells and deliver intracellular signals through the G proteins. These signals activate β2 (for example, lymphocyte function-associated antigen-1; LFA-1) or α4 (very late antigen-4; VLA-4) cell-surface integrins. In the third step, the activated integrins of the rolling cells form strong attachments to the immunoglobulin superfamily molecules (such as intercellular adhesion molecule-1 [ICAM-1] or vascular cell adhesion molecule-1 [VCAM-1]) of endothelial cells, resulting in cell arrest, transendothelial migration and localization in extravascular tissue. Cell migration in postcapillary venules can be simulated in a parallel-plate flow chamber coated with the appropriate ligand or an endothelial cell monolayer and mounted on the stage of an inverted phase-contrast microscope. The cells are perfused into the flow chamber under physiological postcapillary venular wall shear stress (1–4 dyn/cm2) and their rolling attachments are videotaped and quantified directly from the monitor screen . Using the flow chamber technology, we showed  that a cell-surface CD44 variant (CD44v4–v10), rather than CD44s, mediates the rolling of mouse cells on HA substrate. This suggests that the CD44 variant has an intermediate affinity for the ligand-binding site required for cell rolling. Too strong an affinity might avoid the adhesion–de-adhesion-dependent cell rolling, a vital step for transendothelial cell migration. Too weak an affinity could reduce cell resistance to the shear stress of the bloodstream, resulting in cell detachment from the HA substrate. The inflammatory cascade might therefore be dependent on the appropriate affinity of the circulating leukocyte CD44 variant. Furthermore, proinflammatory cytokines (such as interleukin [IL]-1α) generated at the inflammation site might induce alternative splicing , forming inflammation-associated CD44 variants. This implies that, once initiated, the inflammatory cascade can be a self-sustained process. As the 'starter' antigen of RA has not been identified, the critical phase of disease initiation cannot be treated at present by direct antigen-targeting therapy. However, once induced, the disease must be fostered by multiple, already-defined factors, at least part of which are essential to but not sufficient for the development of the RA inflammatory cascade. The gradually increasing cell population in RA joints includes neutrophils, macrophages and fibroblasts, as well as T (mostly CD4+ and fewer CD8+) and B lymphocytes. Some of these cells are derived locally, whereas others are descendants of infiltrating leucocytes. In principle, all these cells, and especially their proinflammatory cytokines and chemokines, can either be used or are currently being used as therapeutic targets (for example, anti-tumor necrosis factor [anti-TNF] antibody and soluble TNF receptor [20, 21]). The list of potential or available targets is long. First, TNF-α, a master cytokine, is secreted mostly by monocytes and macrophages, which induces the synthesis of other proinflammatory cytokines (IL-1, IL-6, IL-8 and granulocyte–monocyte colony stimulating factor [22–24]). In addition, TNF-α stimulates the expression of ICAM-1 adhesion molecules on fibroblasts  and activates chondrocytes to release tissue-destroying matrix metalloproteinase (collagenase) , leading to joint damage. Second, interleukin-1, mainly produced by monocytes and macrophages, stimulates the release of metalloproteinase (collagenase) from chondrocytes . Third, oncostatin M, produced by macrophages, promotes, when synergized with IL-1α, matrix metalloproteinase (collagenase) synthesis by both chondrocytes and synovial fibroblasts . Fourth, IL-6, produced by T cells, macrophages and fibroblasts, stimulates the proliferation of synovial fibroblasts , which, together with macrophage-like synoviocytes and B cells, generate the cartilage and bone-invading pannus, enriched with metalloproteinases. Fifth, fibroblast growth factor-2 (FGF-2) and vascular endothelial growth factor (VEGF) induce the formation of a new vascular network (angiogenesis) [29, 30]. Notably, FGF-2 generated by mast cells and endothelial cells of arthritic joints  can induce VEGF expression  and fibroblast proliferation. Eventually, cytokine and growth factor receptors could also be therapeutically targeted. However, in using this approach, careful measures should be taken because anti-receptor agents can induce agonistic rather than antagonistic effects. Many of the joint pathological activities of patients with RA, including the disease induction phase, are directly or indirectly dependent on cell extravasation into the joint tissue. If the extravasation is dependent on CD44, this molecule should be ultimately considered a master target in RA. Moreover, as CD44 is intensively alternatively spliced, the CD44-mediating extravasation might in fact be a CD44 variant that is not expressed, or expressed to a smaller extent, on cells engaged in physiological activities, leaving a handle for selective targeting. In this respect CD44 has an advantage over other proinflammatory factors, which are subjected, if at all, to much less alternative splicing. The presence of CD44 and HA in the RA synovium is well established although, quantitatively, considerable variations have been obtained in different studies. Western blot analysis showed that the levels of CD44 in the synovial tissue of patients with RA are 3.5-fold and 10.7-fold higher than those of patients with osteoarthritis (OA) and patients with joint trauma, respectively, and that the high level of CD44 is related to the degree of inflammation . In contrast, other investigators  reported lower levels of CD44 in RA synovial tissues or fibroblasts than in the corresponding normal tissues or fibroblasts, using immunostaining, Western blotting and enzyme-linked immunosorbent assay. In another study, histochemical immunostaining revealed equal CD44 expression in both RA and OA synovial tissues, including macrophages, fibroblasts and lining cells, that was stronger than in normal synovial tissues . Enhanced expression of CD44 was also found on synovial lymphocytes and macrophages of rats with adjuvant arthritis . In addition, CD44 expression was markedly increased on lymphocytes from the synovial fluid of patients with RA relative to that of lymphocytes from the peripheral blood of the same subjects [36–38]. These disparate findings can be attributed both to different approaches in evaluating the data (for example, normalized or non-normalized protein concentrations) and to variations in the sensitivity of the methodology used (Western blot versus immunohistochemistry). Nevertheless, fibroblasts from RA synovia showed a high expression of CD44 alternatively spliced variants, including long isoforms like CD44v3,v6–v10. This phenomenon was not consistent in the synovial fibroblasts of patients with OA and was not found in fibroblasts of non-inflamed synovia [39, 40]. These findings suggest either that joint inflammation activates the CD44 alternative splicing machinery or that fibroblasts expressing CD44 variants are selected at the inflammation site. Hyaluronan, the principal countermolecule of CD44, is present at lower concentrations in rheumatoid synovia (0.71 ± 0.1 mg/cm3) than in the non-inflamed synovium (1.07 ± 0.16 mg/cm3) [41, 42], a tissue containing one of the highest concentrations of HA in the entire human body . However, the ratio of extractable or 'free' HA to non-extractable or 'bound' HA in rheumatoid synovium is 2.5-fold that in non-inflamed synovium , which explains why the circulating HA is elevated in the serum of patients with RA. The mean level of serum HA in patients with RA was 3–7-fold [43–45], and in patients with OA 2-fold , that in normal individuals (26–42 ng/ml). Serum HA levels of patients with RA gradually increased during the follow-up period , accounting for time-related variations in different reports. In addition, there is some disagreement on the correlation between serum HA level and the degree of inflammation . Human fibroblasts enhance the synthesis of hyaluronan in response to stimulation with IL-1β or TNF-α . In its native form, HA is present as a high-molecular-mass polymer, but during inflammation smaller molecular fragments accumulate. Fragmented HA (less than 500 kDa), rather than the high-molecular-mass HA (more than 1 MDa) , stimulates the cell-surface CD44 receptor, leading to intracellular signaling, gene activation and expression of proinflammatory mediators such as NF-κB , nitric oxide synthase  and chemokines . Low-molecular-mass fragments of HA also stimulate angiogenesis , an important factor in inflammation. Notably, activated hyauronidase and reactive oxygen-derived free radicals mediate the fragmentation of hyaluronan, as for example in inflammatory joint disease, leading to the accumulation of low-molecular-mass HA [52–55]. The substantial presentation of CD44 and hyaluronate in the inflamed synovium of patients with RA is a good reason to explore the involvement of CD44 in this pathology, but it cannot be considered conclusive evidence on its own. Efforts should therefore be focused on targeting in vitro and, more importantly, in vivo of CD44 or its ligands and monitoring the influence of such targeting on functions involved in the RA disease process. The arsenal of targeting reagents could include anti-CD44 antibodies, CD44 soluble peptides (such as CD44–immunoglobulin conjugates), soluble ligands and ligand-cleaving enzymes. The consequences of targeting cell-surface molecules could be signal transmission and promoting disease development (for example the release of proinflammatory cytokines), or, in contrast, blockade of the proinflammatory molecules. When CD44 molecules expressed on fibroblast-like synovial cells from patients with RA were cross-linked with anti-CD44 mAb, VCAM-1 was autocrinically upregulated by the activation of activator protein-1 transcription factor, which controls the VCAM-1 gene promoter. HA, especially when fragmented, also upregulated VCAM-1. Fibroblast-like synovial cells, expressing VCAM-1 after being cross-linked with anti-CD44 mAb, displayed enhanced adhesion to activated T cells, mediated by VCAM-1–VLA-4 and LFA-1–ICAM-1 interactions . Hence, the cross-talk between cell-surface CD44 and VCAM-1, and the consequent interaction between fibroblasts and T cells, might lead to the release of proinflammatory factors from both partners (for example, enzymes from fibroblasts and cytokines from T cells). Activated T cells (for example those stimulated by phorbol 12-myristate 13-acetate plus ionomycin, anti-CD3 plus anti-CD28 mAbs or simply by tetanus or staphylococcal enterotoxin) acquired the ability to bind soluble fluorescein-labeled HA and to roll on immobilized HA under physiological shear stress (2.0 dyn/cm2), as shown by videotaping from a flow chamber. Rolling was blocked with anti-CD44 mAb and soluble HA, suggesting a dependence on CD44–HA interaction [5, 57–59]. CD44-dependent rolling on HA under physiological shear stress was also detected in T cells from inflamed human tonsils and from the blood of patients with pediatric rheumatology, systemic lupus erythematosus and chronic arthropathies. Cells with rolling capability were found mainly in the blood of patients with active diseases, but not in the blood of those with inactive diseases . These results suggest that the extravasation of T cells into arthritic tissue, which is dependent on rolling, is mediated by the interaction of cell-surface CD44 with endothelial cell hyaluronan. To simulate cartilage generation in the joint, a three-dimensional culture system has been constructed by using human chondrocytes cultivated in collagen sponges pretreated with bovine embryonic extracellular matrix (ECM). The production of a cartilaginous matrix by the chondrocytes was monitored by the incorporation of 35S into the proteoglycan . The addition of RA synovial fibroblasts caused destruction (presumably enzyme-mediated) of the cartilage, as indicated by release of 35S. When the fibroblasts were co-cultured with a monocyte cell line or monocyte-derived cytokines (TNF-α, IL-1β), cartilage damage was enhanced, whereas the addition of IL-1 receptor antagonist or anti-IL-1β mAb decreased the destruction of the cartilaginous matrix. If the fibroblasts were pretreated with anti-CD44 mAb and then added to the three-dimensional culture, cartilaginous matrix destruction was also markedly inhibited . This suggests that the deleterious interaction between RA fibroblasts and cartilage is mediated by CD44 on the fibroblast cell surface. It would be of interest to know which CD44 isoform is involved, and which CD44 countermolecules are present in the cartilaginous matrix. In this context, it should be mentioned that RA-like synovial fibroblasts, which invade Matrigel, as monitored by transwell assay in vitro, are enriched in v3- and v6-containing CD44 isoforms. This invasion was significantly inhibited by anti-CD44v3 and anti-CD44v6 mAbs, rather than by mAbs directed against constant (pan) CD44 epitopes or against epitopes included in the v7/v8 exon products . Hence, v3 and v6 encoded epitopes confer an invasive advantage on RA fibroblast-like fibroblasts. In contrast, the anti-CD44v7/v8 mAb impeded the proliferation of RA fibroblast-like synoviocytes , indicating that epitopes in the v7/v8 region provide a proliferative advantage, possibly after interaction with unknown matrix components. Studies in vitro suggest that CD44 is associated with various RA manifestations. If this is true, injection of anti-CD44 mAbs into animals with experimental human-like arthritis should abolish the disease or markedly hinder its development. Several research groups [9–11, 62, 63] have taken up this experimental challenge. The administration of anti-CD44 mAbs to DBA/1 or BALB/c mice at the onset of CIA or proteoglycan (cartilage-derived)-induced arthritis decreased the arthritic activity as evaluated by joint swelling [9, 11, 62], incidence of arthritis , clinical score , histopathology [9, 11, 62] and the degree of ankle joint extension . A substantial decrease in the accumulation of arthritic fluorochrome-labeled leukocytes in inflamed synovial tissues was observed after their intravenous injection into arthritic mice administered with anti-CD44 mAb . This implies that the antibody interferes with CD44-dependent cell migration into the inflammatory site. We confirmed this conclusion by transferring splenocytes from arthritic mice into naïve SCID (severe combined immunodeficiency) mice that had been administered with IRAWB14 anti-CD44 mAb. Injection of the antibody completely abolished the generation of arthritis in the recipient mice . The anti-arthritic mechanism of anti-CD44 mAbs in these animal models can be interpreted in several ways. Mikecz and colleagues [9, 38, 62] maintain that the interaction of IM7.8.1 anti-CD44 mAb with CD44 induces shedding of this cell-surface glycoprotein, which is subsequently detected in the circulation. However, they themselves show that although KM201 anti-CD44 mAb did not induce loss of CD44 from the cell surface, it inhibited further development of the experimental arthritis. In contrast, IRAWB14 anti-CD44 mAb, which induced the loss of CD44 from the cell surface, enhanced the arthritic activity . These inconsistent findings, detected by the use of different mAbs, imply that additional mechanisms must exist. We ( and Nedvetzki and Naor, unpublished data) suggest that IM7.8.1 anti-CD44 interferes with the interaction between cell-surface CD44 and HA, which is essential for leukocyte accumulation in the inflamed site. This conclusion is based on the fact that Fab' fragments of anti-CD44 mAb induced partial resistance to CIA . This finding supports the notion that anti-CD44 mAb blocks CD44 function rather than modulates CD44 expression, because modulation requires intact antibody, or at least F(ab')2 fragments. Furthermore, we found that hyaluronidase also markedly reduced the arthritic activity in DBA/1 mice (Nedvetzki and Naor, unpublished data) and diabetogenic activity in NOD mice . Serum interferon-γ (IFN-γ) was markedly elevated after an injection of type II collagen, together with IM7.8.1 anti-CD44 mAb, which was used to decrease CIA severity in DBA/1 mice . Amelioration of the disease after this treatment was attributed to the antiproliferative action of IFN-γ and to the ability of this cytokine to downregulate IL-1, which is involved in bone resorption . Finally, IM7.8.1 anti-CD44 mAb inhibited the formation of a hyaluronan-rich pericellular matrix around synovial cells in vitro and reduced joint oedema in vivo. This suggests that IM7.8.1 can inhibit the accumulation of pericellular HA-bound water in the ECM  (the ability of hyaluronan to retain water is a well-established feature of this GAG). Several anti-mouse CD44 mAbs can induce partial or even almost complete resistance to experimental arthritis. Some of these antibodies, including KM201 , KM81  and IRAWB14 , recognize CD44 constant epitopes within or near the HA-binding domain . Another anti-mouse CD44 mAb, IM7.8.1 [9, 11, 62], which interacts with a constant epitope outside the HA-binding domain , can, at least in some cells, decrease HA binding to CD44 [64, 65], perhaps by affecting the configuration of the cell surface. Interestingly, IM7.8.1 (which also cross-reacts with human CD44), rather than mAbs recognizing the HA-binding site, is the most efficient inducer of resistance to arthritis in experimental animal models [11, 62]. This suggests that the IM7.8.1-binding site is the most potent proinflammatory epitope or, alternatively, that the ligand affinity of IM7.8.1 mAb is stronger than that of the other mAbs. We showed  that KM81 Fab' fragments induced partial resistance to CIA in DBA/1 mice. Although this response was weaker than that induced by the intact mAb, the interpretation of the effect is of both academic and practical importance. The finding suggests that at least part of the KM81 anti-arthritogenic effect is related neither to Fc-dependent activities (complement-dependent cytotoxicity or antibody-dependent cellular clearance) nor to shedding of the cell-surface receptor , as these activities are attributable to intact antibodies or, as far as receptor modulation is concerned, at least to F(ab')2 fragments. Our IRAWB14 data  are incompatible with the findings of Mikecz et al. . We did not detect CD44 loss in mouse leukocytes 24 h after injection of IRAWB14 anti-CD44 mAb , indicating that even if they lost their cell-surface CD44 they could recycle it within this period. Furthermore, although our group and Mikecz et al. used a similar treatment strategy, we found  that IRAWB14 mAb inhibited experimental arthritis, whereas the latter claimed  that the same anti-CD44 mAb aggravated the arthritic activity. Differences in mouse strains (DBA/1 versus BALB/c) and type of disease (CIA versus proteoglycan-induced arthritis), as well as small variations in experimental techniques, might account for this discrepancy. Injection of anti-CD44 mAb into mice with CIA or proteoglycan-induced arthritis did not influence their humoral and cellular responses to collagen or proteoglycan [10, 62]. It was further reported  that the delayed type hypersensitivity (DTH) to oxazolone (T cell-dependent response), but not olive oil-induced inflammation (T cell-independent response), was reduced in mice treated with IM7.8.1 anti-CD44 mAb. Using the NOD transfer model and a treatment protocol almost identical to the one reported for CIA, we succeeded in inducing resistance against diabetes by injecting IM7.8.1 anti-CD44 mAb into male recipient mice infused with diabetogenic female splenocytes . However, in contrast to the above-mentioned report , the DTH to oxazolone was not influenced by this treatment in our experiments. Despite this discrepancy, which can be related to the different experimental models, it seems that at least some arms of the immune response are not substantially affected by injection with anti-CD44 mAb, whereas the antibody has a significant effect on autoimmune inflammation. It is conceivable that some conventional immune responses require higher concentrations of anti-CD44 mAb than do autoimmune inflammatory responses in order to reach the threshold of sensitivity to the treatment. The reduced destructive inflammatory activities in mice treated with anti-CD44 mAb [6, 9–13] suggest that the related diseases, including CIA, are dependent on CD44. If this is true, CD44 knockout mice should resist the development of arthritis after being injected with type II collagen. Although anti-CD44 mAb interferes with embryonic development in mice , CD44 knockout mice display an almost normal phenotype. No gross developmental or neurological abnormalities were evident; neither were there deficits in hematopoiesis, leukocyte count, cellular composition or CD4+/CD8+ distribution in these animals. The levels of total serum Ig and isotype subclasses, as well as immune responses to mitogens and foreign antigens, including type II collagen, are normal in CD44-deficient mice [67–70]. The expression of adhesion molecules, except for a decrease in L selectin level, is also normal in such mice . However, augmented levels of granulocyte–macrophage colony-forming units in bone marrow and lower numbers of these progenitors in the spleen and peripheral blood were noted . In addition, the CD44-deficient mice showed delayed lymphocyte homing to the lymph nodes and inefficient homing to the thymus , although these anomalies do not cause any major visible defect. To determine the influence of CD44 deficiency on CIA, Mikecz and colleagues  used a targeting vector designed to delete, by homologous recombination, most of exons 4 and 5 in the murine CD44 gene, including a substantial part of the HA-binding domain and the coding site of the IM7.8.1 epitope. The linearized targeting vector was introduced into DBA/1 embryonic stem cells, which were then microinjected into C57BL/6 blastocytes to generate chimeric offspring. Wild-type and homozygous CD44-deficient mice, backcrossed to DBA/1 mice, were identified by polymerase chain reaction, with the use of primers specific for CD44 and/or neomycin genes. Although the investigators emphasized the reduced arthritic activity (both incidence and severity) in CD44 knockout mice treated with type II collagen and the delayed infiltration of CD44-deficient arthritic lymphocytes into the joint tissue of wild-type arthritic recipients [69, 70], it is very clear from their own data that the bulk of the joint inflammatory reaction was persistent in these animals. This finding suggests that CD44 is not an essential factor in CIA. However, if this is so, why does anti-CD44 mAb substantially impede CIA even when administered after disease onset [9, 11]? We must therefore conclude that a lack of CD44 activity during embryogenesis, rather than its targeting in adulthood, exerts a survival pressure leading to a compensatory process that later supports CIA. A similar situation might exist in the experimental lung inflammation induced by bleomycin administration. Whereas in wild-type mice the inflammatory response is resolved, in CD44 knockout mice the inflammation is elevated in an uncontrolled manner, leading to an impaired clearance of apoptotic neutrophils, a persistent accumulation of fragmented HA, an impaired activation of transforming growth factor-β1, an increase in total cell count, and death . The redundancy in CD44-deficient mice might be associated with a decline in cell-surface L selectin that decreases cell homing to the lymph nodes, allowing more intensive cell infiltration into the joints . Alternatively, it is possible that a different molecule, possessing at least some of the CD44 functions, is upregulated during the development of the CD44-deficient embryo and is later used to support the generation of CIA. We are now focusing our efforts on identifying the replacement molecule in CD44-deficient mice with CIA. CD44, which is expressed on both local and infiltrating cells from joints of patients with RA, has a substantial role in the development of CIA, the animal model that mimics several aspects of human rheumatoid arthritis. Considerable levels of hyaluronic acid, the principal ligand of CD44, are also found in RA joints and it is functionally associated with CIA. It was suggested that cell-surface CD44 is involved in HA-mediated cell rolling on the endothelium of blood vessels, an essential step preceding the integrin-dependent transendothelial migration, leading to an accumulation of destructive inflammatory cells in the synovial tissues . In addition, a human culture model suggests that fibroblast cell-surface CD44 mediates the interaction between fibroblasts and cartilage, possibly by recognizing collagen and/or one or more other ECM components . This interaction might allow the focal release of proteolytic enzymes from the former, causing damage to the collagenous tissue. It was further proposed that the CD44 of macrophages from RA synovium presents fibroblast growth factor to the cognate receptor , leading to a proliferation of endothelial cells and fibroblasts. This list might include additional CD44-dependent biological activities (see the section on CD44 structure and function) that could potentially support the RA inflammatory cascade; however, this awaits formal evidence. The disruption of CD44–ligand interaction by targeting one of these partners should therefore interfere with the development of arthritic inflammation, even if this process has already been initiated. Indeed, we and others [9, 11] have shown that injection of anti-CD44 mAb after the onset of CIA markedly reduced the inflammatory activity. However, in all experiments, the antibody was directed against constant epitopes shared by all CD44 isoforms, including those expressed on cells engaged in physiological functions, rendering the use of this kind of antibody less attractive for clinical therapeutic trials. The ultimate alternative would be to focus efforts on the identification of CD44 splicing variants that are exclusively or preferentially expressed on the CD44 of synovial fluid cells from patients with RA and to produce mAbs recognizing the RA-associated epitopes. Alternative splicing might generate, in addition to multiple CD44 variants, sequence alternations at the splicing junctions of the pre-mRNA, a process that could be enhanced by the inflammatory environment. If the translated protein is also modified and a configurational change results, an RA-specific CD44 epitope should be generated that could then be targeted by specific antibodies. This approach would be substantially bolstered if it were found that the RA-associated CD44 variant, or the RA-associated CD44 modified epitope, has a biological function essential to the inflammatory cascade. Validation of all these predictions should be a major goal for future studies. We thank Dr Alexandra Mahler for editorial assistance and Sharon Saunders for typing the manuscript. The research of our group was supported by the associates of The Lautenberg Center, New York, NY.